Disclosure: This is a compensated campaign in collaboration with Cavit and Honest Cooking Magazine. Thank you for supporting the brands that I work with and love. 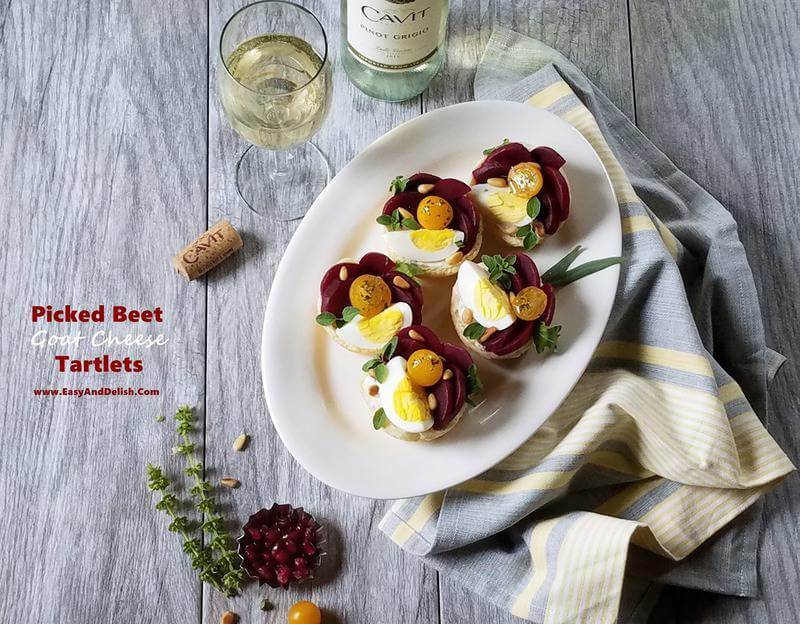 These Pickled Beet Goat Cheese Tartlets are a quick and gorgeous appetizer, perfect for the Holidays as well as for any other winter celebration. The holidays are almost here… and along with them a festive meal with family and friends. Appetizers are a must! Especially the kind that can be prepared in almost no time, leaving us free to take care of the main and side dishes. 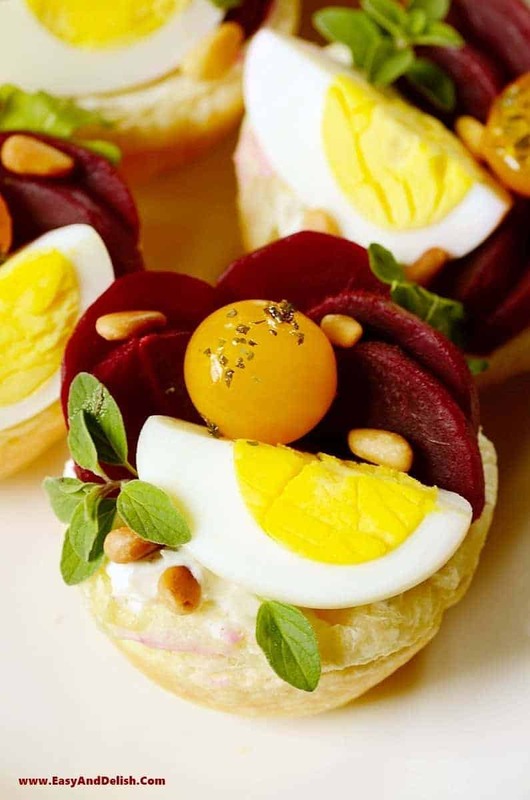 This time we whipped up some easy and delish Pickled Beet Goat Cheese Tartlets. They are a feast for the eyes, don’t you think?! Yet they are super simple to make. 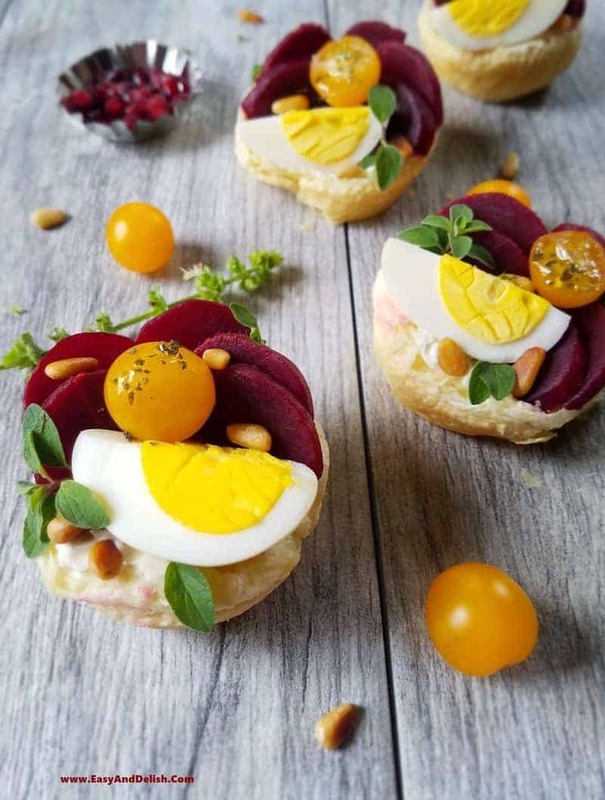 These are basically made from store-bought puff pastry, a mixture of goat and cream cheeses, jarred pickled beets, golden tomatoes, toasted pine nuts, and tarragon. All one has to do is to cut the puff pastry into rounds using a cookie cutter, place them into a muffin tin, and bake for about 10-15 minutes or until lightly golden brown. Let cool and fill with a mixture prepared with cream cheese, goat cheese, seasonings, heavy cream, and chopped tarragon. Then, garnish with jarred pickled beets, golden tomatoes, herbs, toasted pine nuts and boiled eggs if desired. You see… easy peasy! They feature contrasting textures (flaky from the puff pastry, creamy from the cheese mixture, and crunchy from the nuts)… as well as contrasting flavors. You will be delighted by the sweet and sour from the pickled beets, nutty pine nuts, peppery flavor from the tarragon, and salty from the cream cheese mixture. I am telling you, they are one unforgettable starter! 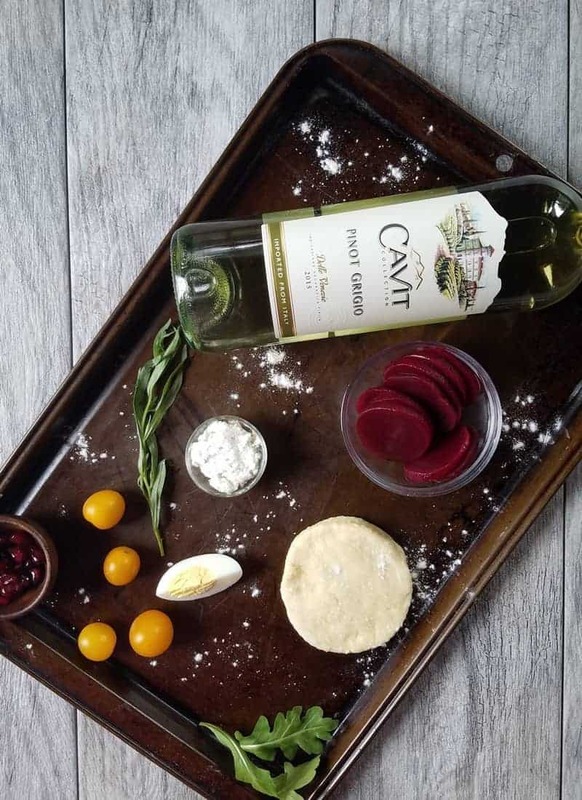 They make the perfect pair for Cavit Pinot Grigio, a white wine from northern Italy. Just like other Cavit Trentino wines, the Pinot Grigio featured today is crafted with quality, honoring its region. And an added bonus is that it is affordable. That’s right! It costs about $8 a bottle. 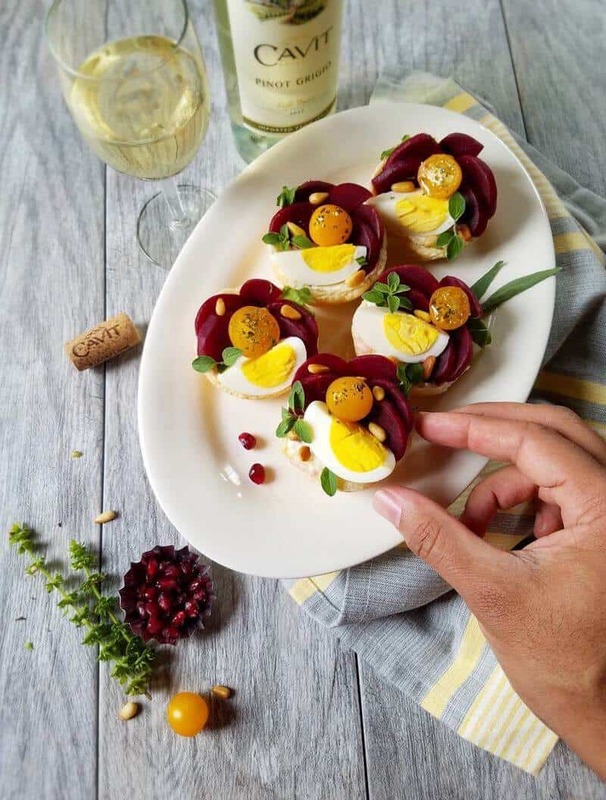 With a balanced character, bright straw gold color, appealing aroma and citrus flavors, this Pinot Grigio pairs well with many of the ingredients present in our Pickled Beet Goat Cheese Tartlets, especially the tarragon, pine nuts, and goat cheese. Enjoy it well chilled, together with our gorgeous and delicious tartlets… and experience the magic of the giving season! I can already envision a gorgeous table set up and many loved ones with warm smiles, all enjoying a feast, presents, and holiday cheer–everything that makes this season so special! And all of us raising a toast with our delicious Pinot Grigio. 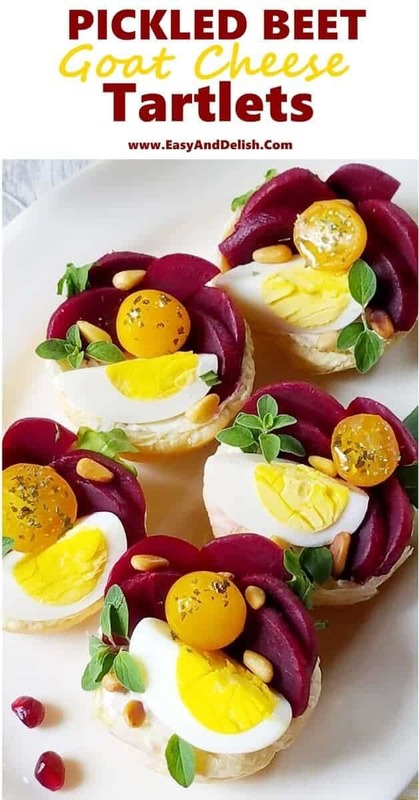 I can also see us all making use of these Pickled Beet Goat Cheese Tartlets well beyond the holiday season. It will become one of those recipes that you can always count on it… an ace up your sleeve. Any party or celebration will be the perfect time! 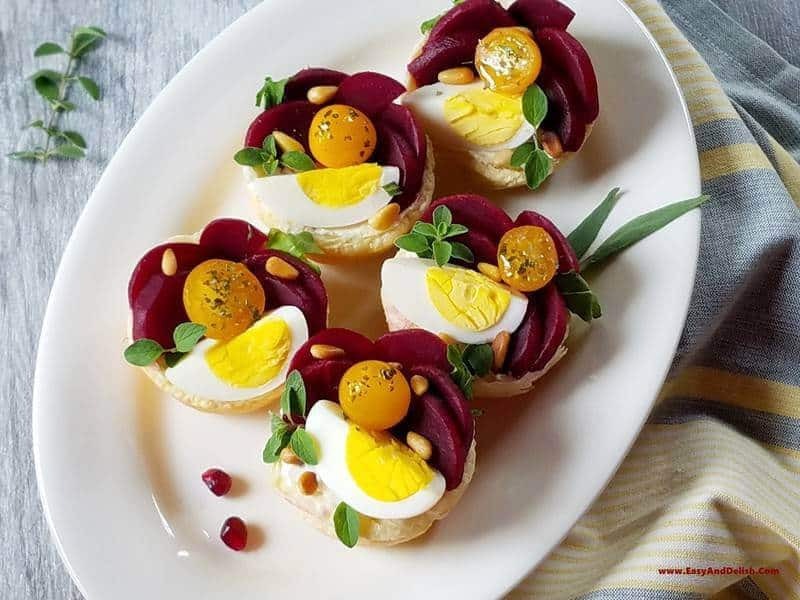 These Pickled Beet Goat Cheese Tartlets are a quick and gorgeous appetizer, perfect for the Holidays as well as any other winter celebration. On a lightly floured surface, cut puff pastry into rounds using a 3 1/4" cookie cutter. Place each round into a regular-size 12-muffin tin. Bake for about 10-15 minutes or until lightly golden. Let cool! They will look like bread rolls. Once cooled, twist off the top of each carefully to make them into cupped tart shells. You can invert the twisted off tops and use them as additional tart shells if desired. Meanwhile, place cream cheese, goat cheese, heavy cream, salt, pepper, sugar, and tarragon into the bowl of a stand mixer with a paddle attachment. Beat all together until obtaining a creamy, homogeneous mixture. Spoon into the tartlets and smooth with the back of a spoon. Place beets onto a cutting board and cut each slice in half. 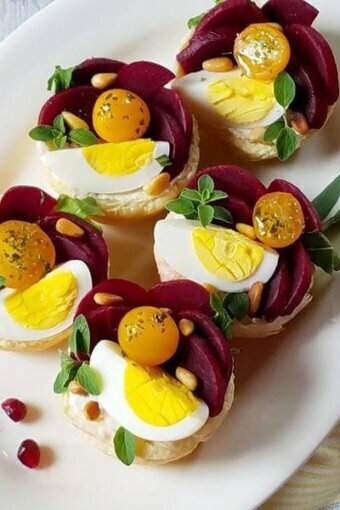 Garnish Pickled Goat Cheese Tartlets as seen in the pictures or as desired (use the pickled beets, golden tomatoes, quartered boiled eggs, toasted pine nuts, and tarragon leaves or baby arugula). Enjoy! By the way – wow – your new site looks marvelous! Fantastic rebranding! Love the new name and logo! I might have to FB message you to get some points as I’ve been thinking of rebranding too. 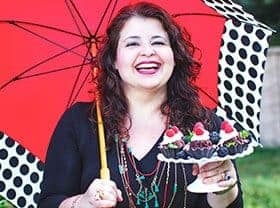 I’m in charge of appetizers this year and this recipe would be a fit! Beets never looked better! Beets and goat cheese? Terrific combo! Can’t get enough of that pairing. Great looking little tarts. BTW, I’m taking off the rest of the year, so I’d like to wish you happy holidays! Beautiful colors, these would make a great starter for the Christmas or New Year’s Eve dinner. These are so cute Denise…and so festive…and yes, I love all the textures…perfect for the holidays! It could be a perfect starter for a New Year’s Party, right :)? I love eggs so this would be a perfect Christmas starter for me! What a pretty little dish to serve as an appetizer. I do hope you and your family had a wonderful Christmas day. Hello! Yes you surely can use that too, but I like both the tartness and sweetness that the pickled beets have. They bring great flavor to this appetizer.